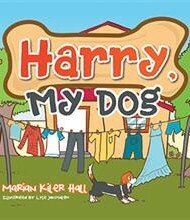 Marian Kiler Hall shares the real-life tale of an adopted Basset Hound named Harry in her enjoyable rhyming picture book Harry, My Dog. The narrator is introduced to Harry, a former stray, while visiting her friends Valerie and Roger. Hall relates how the couple found Harry, took him in, cleaned him up, and set up an electric fence in the yard for him. She relates the things Harry loves to do, including running around the yard and rolling in the grass, and details the day Harry wanders near their pool and falls in, but manages to swim to safety. The story concludes with the end of the author’s visit as she says goodbye to her friends and Harry. Despite the book’s flaws, Harry proves a lovable character, and young children, who don’t care much about punctuation or the occasional flat rhyme, should enjoy this short, sweet story.